Here's a list of the longest VPN free trial & money-back guarantee periods so you can "try before you buy" with confidence and peace of mind. Looking for the best VPN free trials? [image: Free Trial by Nick Youngson CC BY-SA 3.0 Alpha Stock Images]. Is it your first time using a VPN? Or maybe you can’t decide which one is best for your needs? Or perhaps you’re just broke but need to use a VPN for a few days? VPN free trials or money-back guarantees may be just what you’re looking for. We’ve compiled this comprehensive list of which VPNs offer the best trials and guarantees so you can have plenty to choose from. There’s something we need to get straight right away. While free trials (and money-back guarantees) can be a cost-effective way to try different VPN services, don’t confuse them with VPNs that claim to be entirely free. We highly recommend avoiding free VPNs, as they’re simply not safe and not reliable. Your privacy cannot be trusted to free VPN services. Now that we've shared that important message, let’s look at the best free VPN trials on the market today. 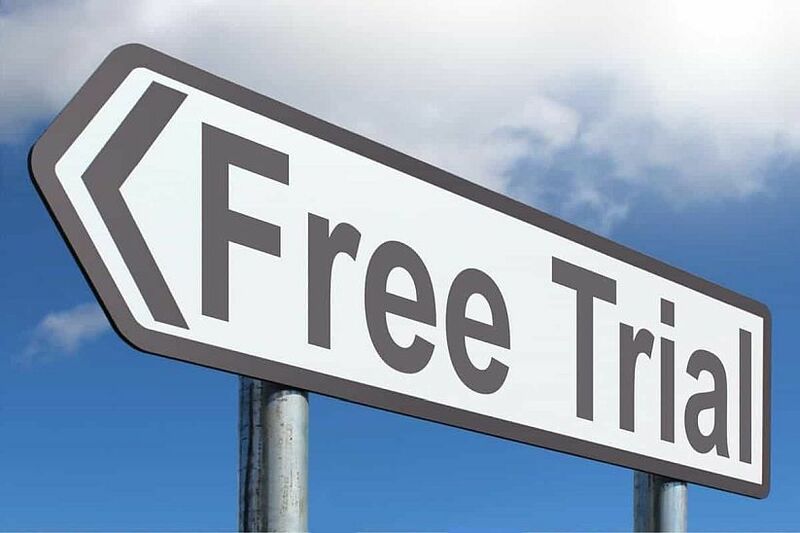 VPN free trials don’t require any payment upfront. In fact, most of them don’t even require payment information. TorGuard’s P2P-friendly VPN service with “Stealth VPN” functionality is worth a try, especially since it’s free for 7 days. CyberGhost used to offer a free version of their VPN, but after some improvements to their software they’ve switched to a 7-day free trial. PrivateVPN is a Sweden-based service with good speeds and a solid price point. You can try this VPN free trial for 7 days with their generous free trial. From the folks at ProtonMail, the privacy-centric email service, comes ProtonVPN. Want to give it a try? Check out their 7-day free trial. We’ve rightfully criticized HideMyAss in the past for keeping logs and failing to protect their users’ privacy, but they still have a generous VPN free trial. Just make sure to cancel before it renews. Visit HMA's pricing page and click on "Want a free trial?". NordVPN is easily the highest-rated VPN that offers a free trial. And they don’t even require payment information! You’d be crazy to pass this one up as it is clearly one of the best VPN services on the market today. While NordVPN is more highly rated, VyprVPN is certainly no slouch. And they offer their own 3-day free trial, but you’ll have to provide payment information for this one. SpyOff’s VPN free trial isn’t quite as generous as it used to be, but it’s still solid – and it only requires your email address. If you’re thinking about signing up for SwitchVPN, you can give it a spin for 3 days with their complimentary free trial. Trust.Zone’s free trial covers you for 1GB of usage or 3 days, whichever comes first. That means you won’t be doing much downloading. Rather than a classic free trial, TunnelBear essentially offers a free version of their VPN – but it only has a data allowance of 500MB per month, which is quite small. CactusVPN is a Moldova-based VPN service that offers 24 hours of full access for free. It's another one of the VPN free trials that don't require a credit card or other payment details. You’ll be a little safer for 24 hours with SaferVPN’s free trial. Okay, we promise to lay off the puns. These money-back guarantee offers require payment upfront, but if you cancel within the allowed time frame, you still end up with up to 31 days of VPN service for free. Looking for the longest VPN money-back guarantee in the business? That titles belongs to PureVPN at 31 days. Okay, so it’s only one day longer than some of their biggest competitors, but it’s still impressive! If NordVPN’s 3-day free trial (see above) isn’t enough time to find out if the service is right for you, they’ve got a 30-day money back guarantee as well. That’s how confident they are that you’ll be a satisfied with their service. This top-rated VPN even comes with a very generous money-back guarantee. Try it for 30 days, see how you like it, and request a refund if you’re not totally satisfied – but we think you will be. PrivateVPN is another service that offers both a free trial and a strong money-back guarantee. You’ll be able to try it for 30 days, risk free. Along with CyberGhost’s free trial, they also offer refunds within 30 days for their paid service if you’re not completely satisfied. SpyOff is so confident you’ll love their service that they offer refunds within 30 days if you don’t like what you see. CactusVPN’s 24-hour trial doesn’t give you much time to get a feel for their service, so you may want to consider their 30-day money-back guarantee instead. IPVanish is another of our favorite VPNs, but their guarantee isn’t quite as robust as NordVPN or ExpressVPN. You’ll love IPVanish’s speeds though! Private Internet Access (or PIA for short) is one of the most affordable premium VPNs on the market and they even offer a 7-day money back guarantee, so you can be sure about your purchase. With TorGuard, you can choose between a 7-day trial and a 7-day guarantee. Either “try before your buy” or “buy with peace of mind”. Both the VPN free trials and money-back guarantees above can be a great way to try out a VPN service. But what exactly should you be looking for? How do you know if the service is good or not? Speed and Reliability: You may have to sacrifice a little Internet speed when using a VPN, but it shouldn’t be excessive. Pay attention to speeds at different times of day and when doing different tasks to see how your VPN performs. Servers: How many servers are there? Where are they located? Are there any in or near your country, and how fast are they? Do they have servers in torrent-friendly countries? Features: Not all VPNs have the same features – and they don’t perform the same either. Play with the UI (user interface) and give the different features, like Kill Switch, Stealth VPN or Double VPN, a spin to see how well they work. Customer Support: Whether you have any problems with the service or not, you may want to try giving customer support a shout just to see if they’re on the ball. Of course, if the above steps sound a little too complicated, you can always check out our list of the best VPNs. We ran ‘em through the ringer, so you don’t have to. And they all offer either free trials, money-back guarantees, or both. Choosing a VPN with a free trial or money-back guarantee is the best way to make sure you get a service that’s right for you. And, remember, if you provided payment information for a free trial (VyprVPN and HideMyAss), make sure to cancel within the trial period. That goes for requesting a refund from the money-back guarantee services as well. Make sure to do it within the guarantee period to get all your money back hassle-free.